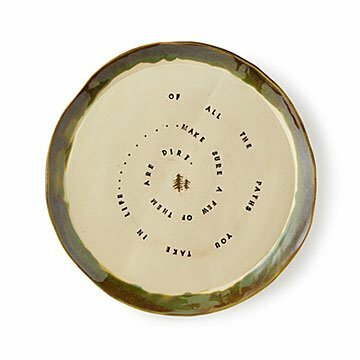 Tonya Browning hand-stamps each ceramic plate with an inspiring message for adventure seekers. Forks in the road? You eat those moments up with a spoon. Tonya Browning's ceramic plate is for those who believe life should be full of detours, new routes, and long ways home. She stamps each one with the inspiring message "Of all the paths you take in life... make sure a few of them are dirt," and finishes each piece with a rich green glaze. Remember: Life is tasty, pile it high with treats. Handmade in Charleston, West Virginia. Microwave and dishwasher safe. Handwashing is recommended.